For business graduates, a career in finance is a good choice. It can open a number of opportunities for your professional and personal growth. For some, being in the field of finance can be tough. Dealing with numbers and accounting is surely not easy. However, for those who are up to the challenge, landing a great finance job position is a dream come true. 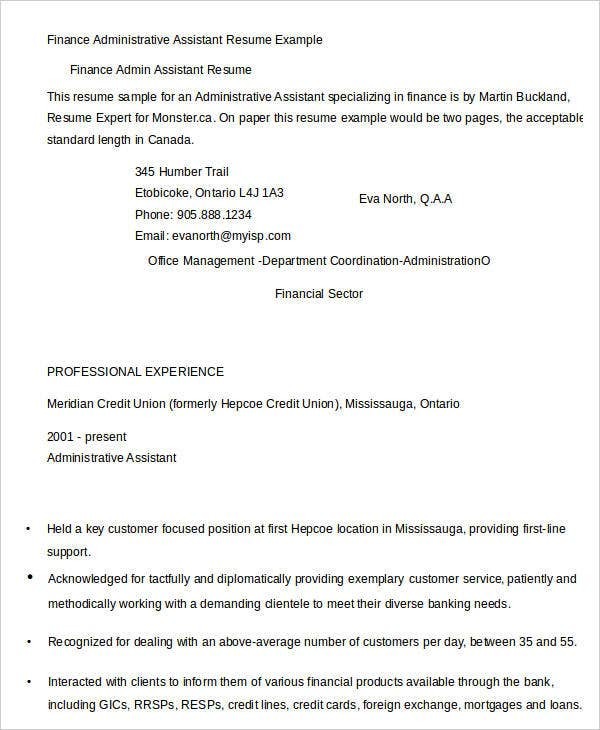 If you’re seeking for a job position in the financial industry, you have to ace your finance resume. 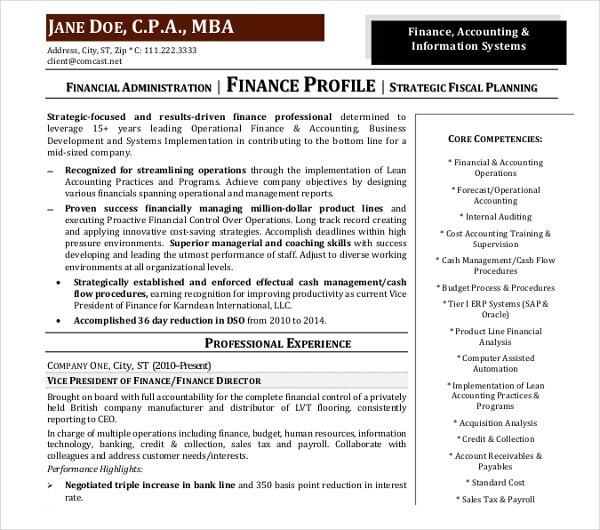 To help you, you can download and customize our finance resume templates which showcase several career positions in finance. 1. 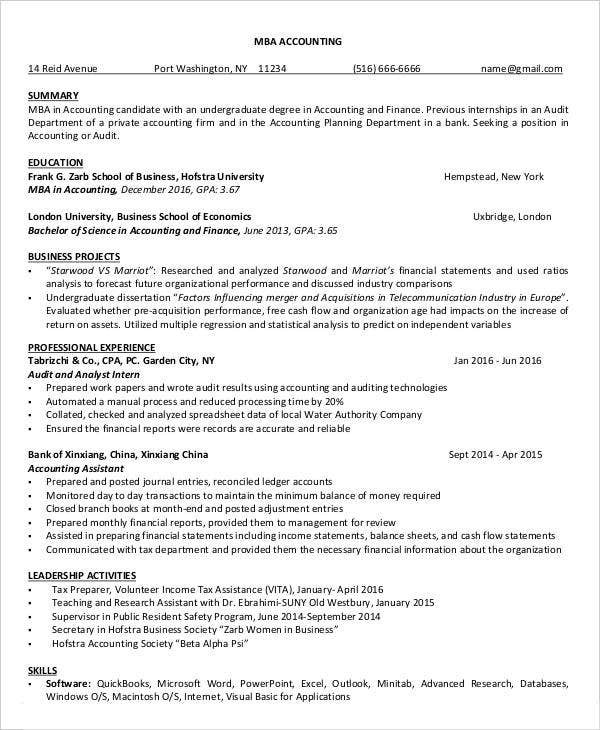 What Is a Finance Resume? According to research, the finance industry is one of the industries that are deemed as multifaceted. The field is so dynamic and broad. It covers business management, investments, and other key aspects of financial planning and management. 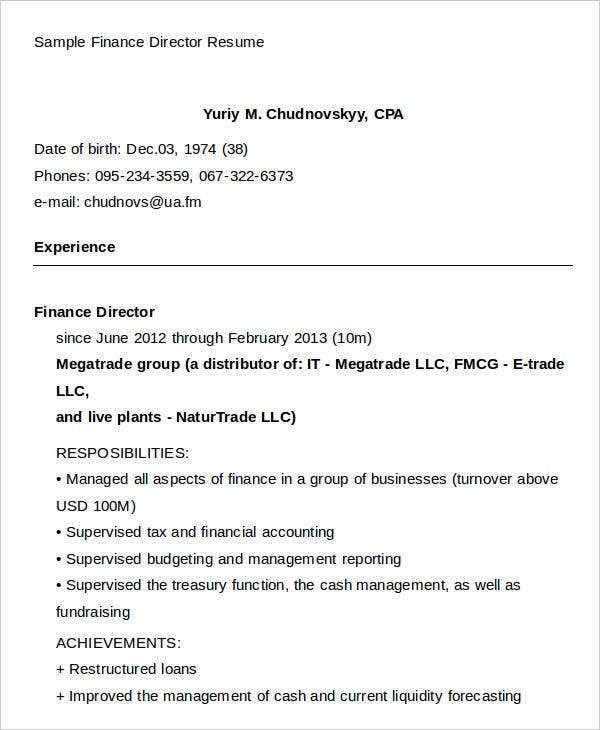 If you desire to enter such field, your finance resume is your ticket. It outlines and provides your qualifications, expertise, education and work competencies, and experiences in the world of finance. Corporate Finance – This refers to the integration of company decision-making in the course of planning its finances. It is also related to budget management. Investments – This is where you’ll be dealing with asset management. You have to ensure that you allocate and utilize the company’s assets in the most profitable and secure way. Financial Markets and Institutions – This area is referring to the dynamics of the stock, bond and other market types while working hand in hand with the other financial institutions. 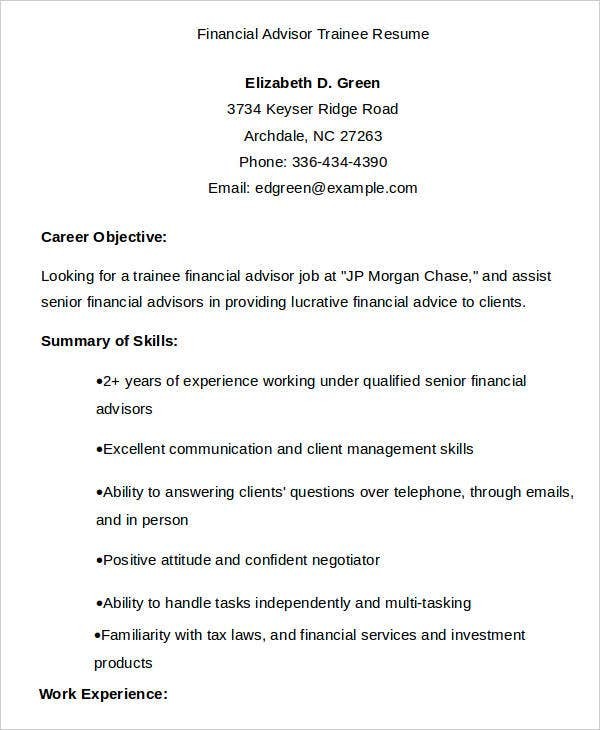 In dealing with these key areas, it is important that you customize your resume to fit your targeted finance position. 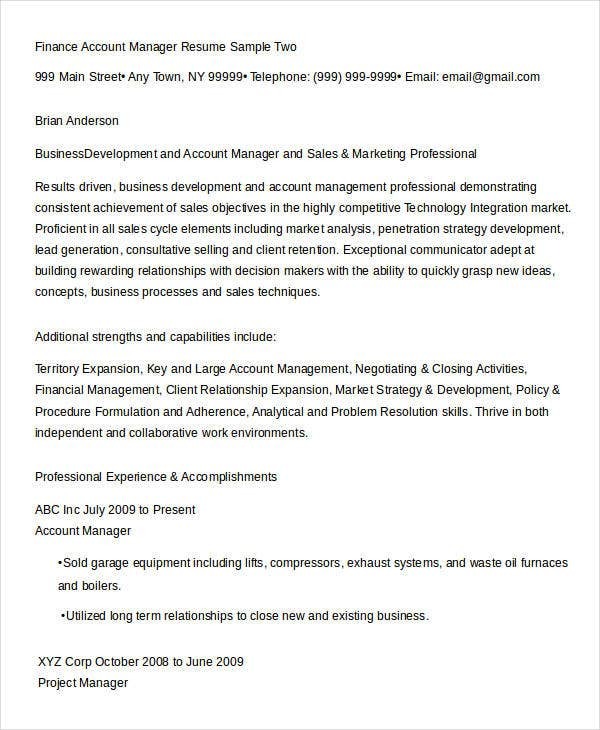 Like dealing with other business resumes, finance resumes still contain common resume components. The variation lies in how you spin and provide finance-related avenues and components to make it stand out from the bunch. 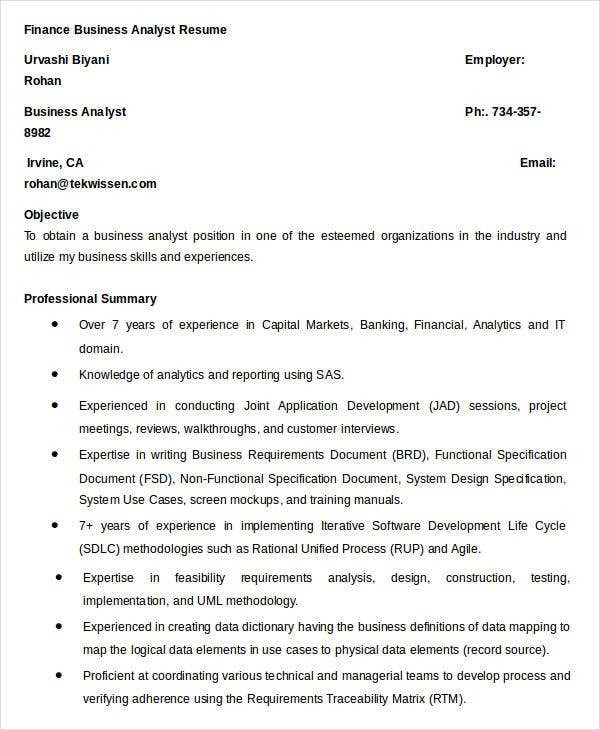 Personal Details – This is a standard among resume formats. You have to provide your full name, temporary and permanent addresses, telephone and mobile contact details, and your professional email address. Professional Summary/Career Objective – According to research, using a professional summary is suited for experienced applicants. If you’re a fresh graduate, you may use a career objective. There is no hard and fast rule when it comes to the headings. Just choose the heading that will perfectly embody your smart goals, objectives, and the quality of work you can contribute to the field of finance. Another option that you may avail is to summarize your key qualifications. In this case, showcase your strengths either your work experience or your academic competencies. Fields of Expertise – Knowing that the financial field is broad, you have to make it convenient on the part of hiring managers to understand what area is good for you. 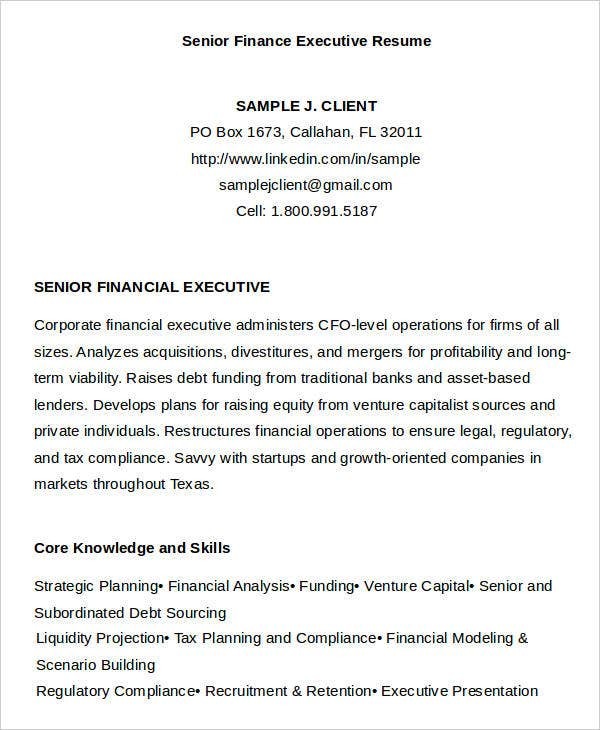 Accomplishments – In the finance realm, hiring managers are very keen in evaluating the contents of your resume samples. Make it a point to include your specific and measurable accomplishments. You can also add relevant statistics to show that you can deliver results. Academic Competencies and Work History – For both entry-level and experienced finance officers, you have to include your educational background starting from the most recent one. For fresh graduates, it is suggested that you include your internship experiences that required the application of your knowledge in finance. As for those who have working experiences, you have to provide the networks that you’ve built. As long as the following components are present in your resume, you’re on the right track. Just ensure to put your own spin on it. 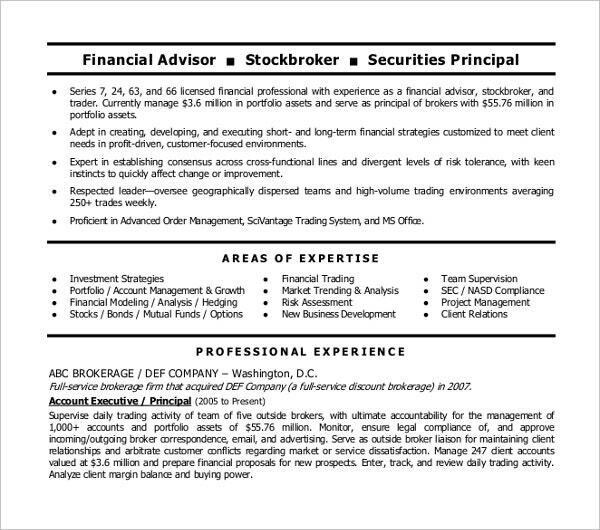 The career in finance is almost all-encompassing. It covers a variety of aspects and business areas. That is why you should be equipped with the right skills and competencies in order to meet the set expectations and standards. 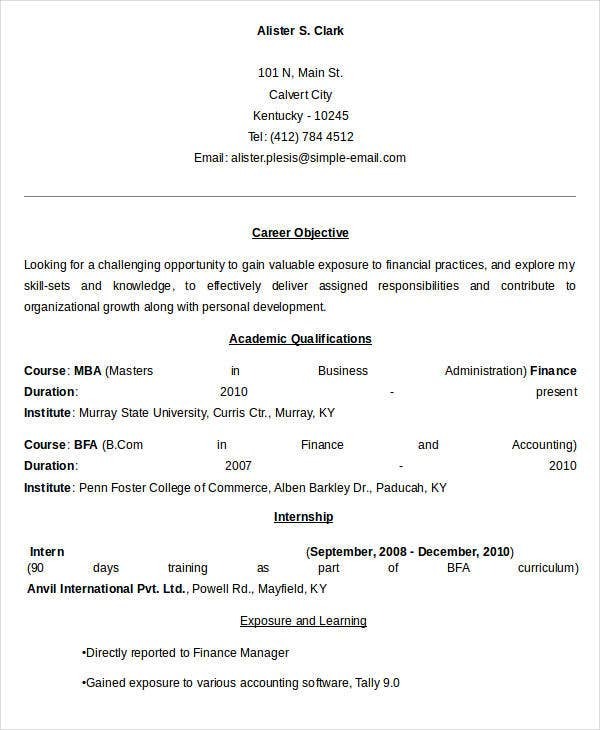 To help you in sorting and planning the content of your resume, we have templates that you can learn from. 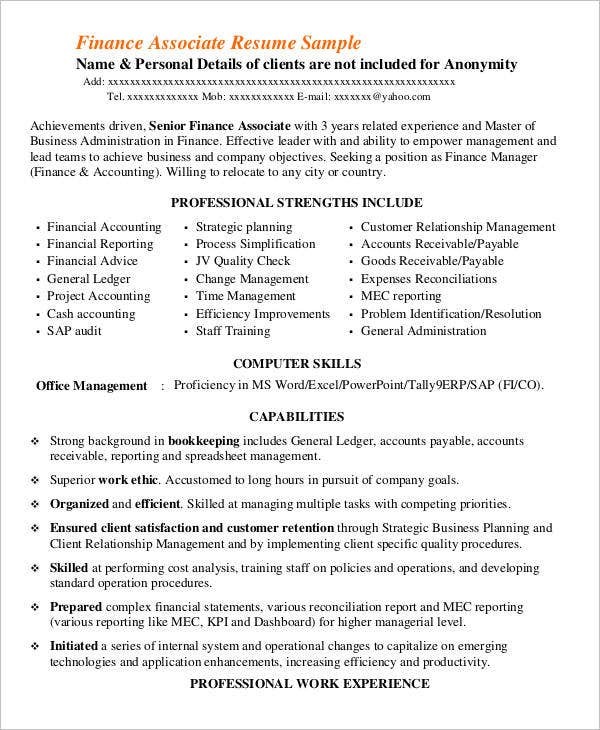 Finance Manager Resume Templates – A finance manager oversees the overall financial standing, accounts, and records of the certain company. He or she is responsible in terms of managing costs, investments, payroll, and any other business dealings that affect the financial structure of the company. In your resume, it is advisable that you can highlight your previous work-related achievements such as for example being able to come up with a financial scheme that reduces the cost which realized more profits. 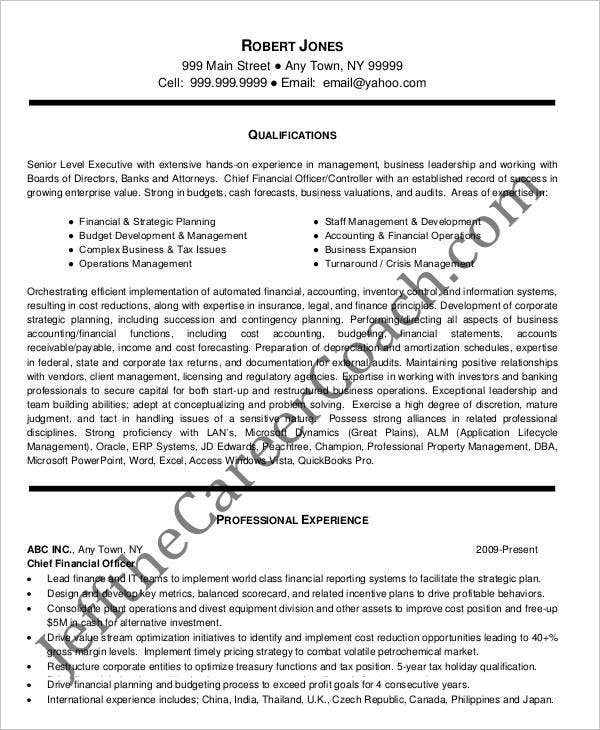 Finance Executive Resume Templates – The scope of work of a finance executive is similar to that of a finance manager but with a higher rank. They are tasked by the company to manage, produce, and critically analyze financial reports such as in the case of cash flow statements and profit projections. In terms of qualifications, hiring managers will look for finance officers with at least 5 or more work experiences. They are also mostly required to have a master’s or much higher degree in finance. As you may observe from the template, some of the key components of the templates are executive summary, core competencies, and other professional experiences. 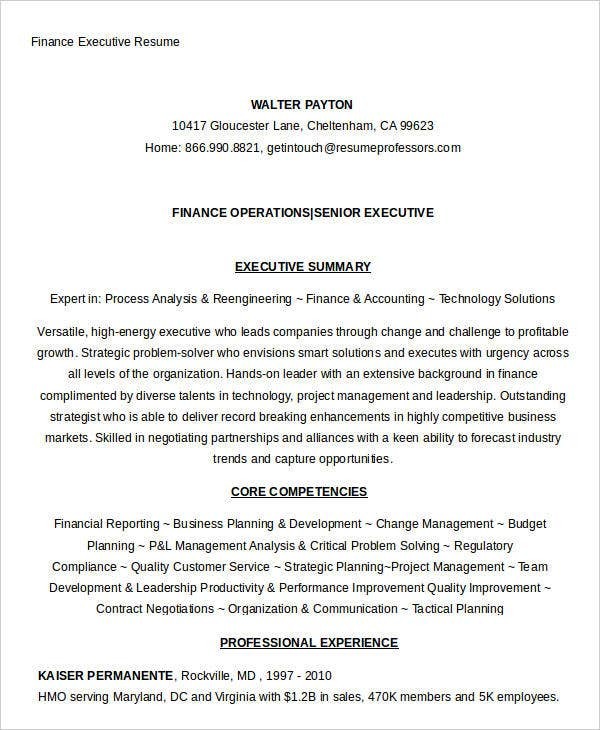 Finance Director Resume Templates – For most businesses, a finance director works as the head of a senior executive team which deals and manages the financial dynamics of a company. 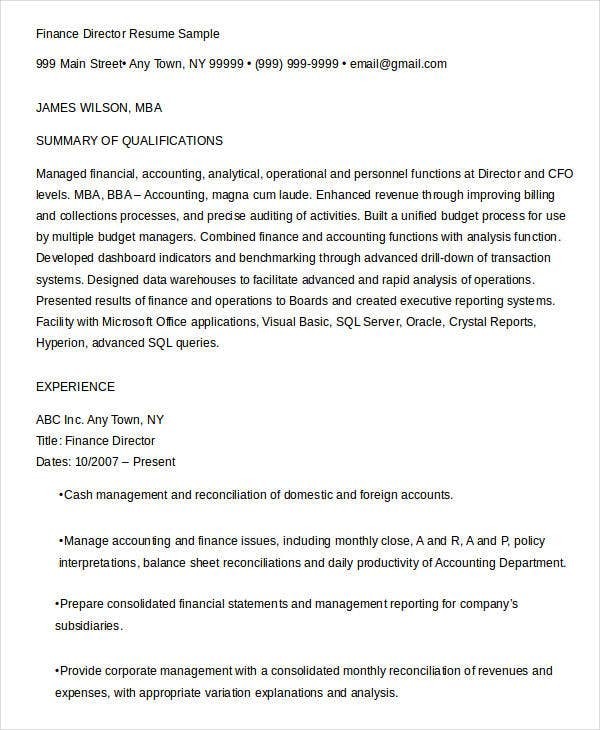 In terms of qualifications, you should have excellent analytical and financial management skills. Because they are managing a team, you should know how to coach, motivate and encourage your team members. 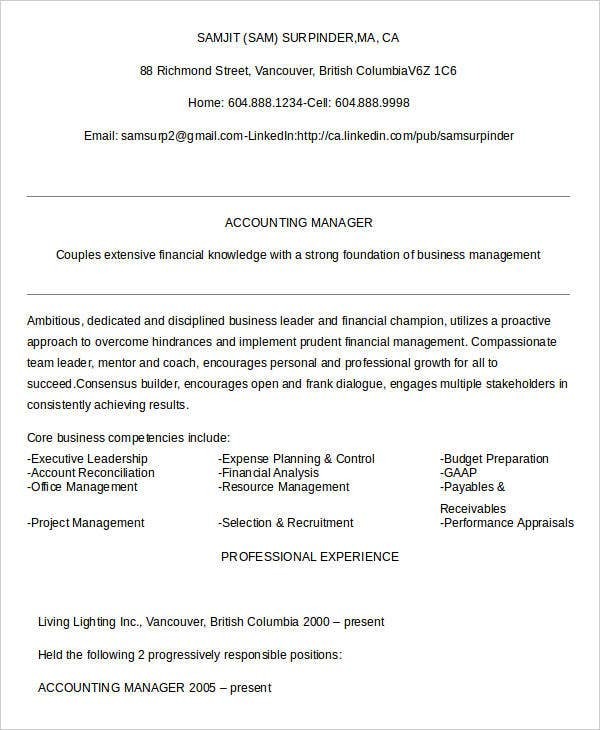 You should also showcase in your resume that you can deal with financial control. 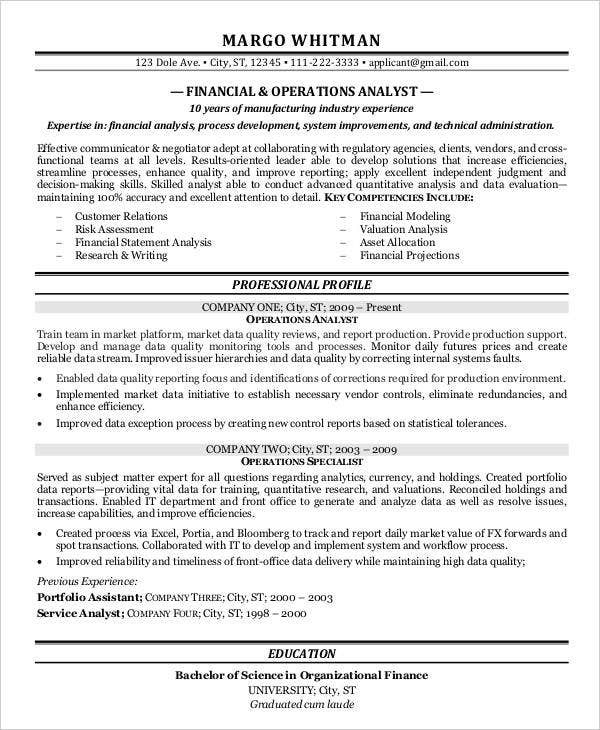 Finance Analyst Resume Templates – If you’re planning to apply for a job as a finance analyst, you should have the research and level of technical skills required. The duties of financial analysts include researching about macroeconomic and microeconomic conditions. In line with this, you should emphasize your research skills and showcase your key accomplishments and publications pertaining to the field of finance. Nowadays, keywords are very important for your resume to stand out from the rest of the applicants. 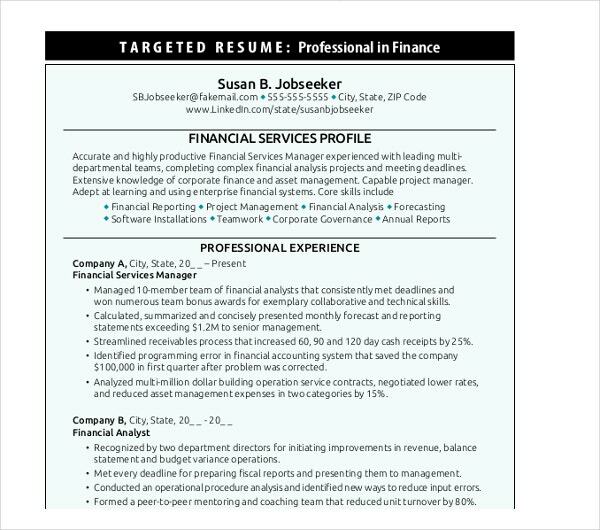 Keywords make your basic finance resume more special and appealing to the eyes of hiring managers. Here are some keywords that we’ve gathered that you can use. 5. 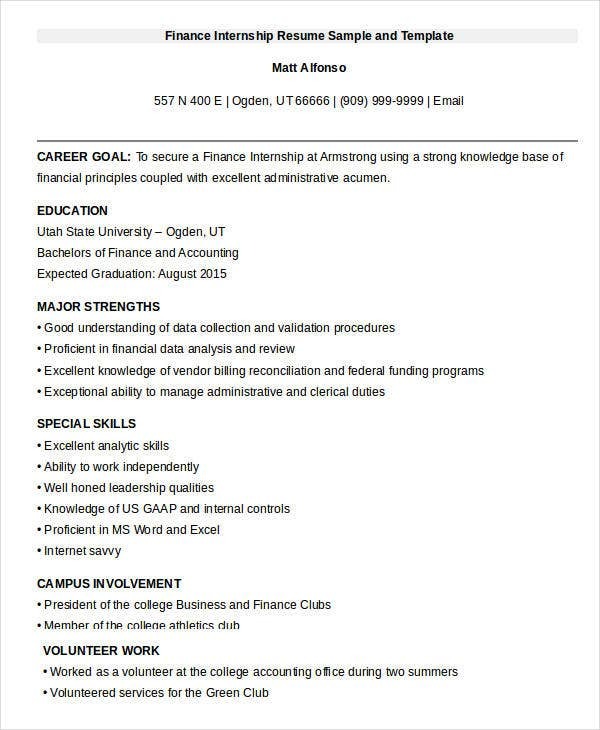 How to Write a Finance Resume? 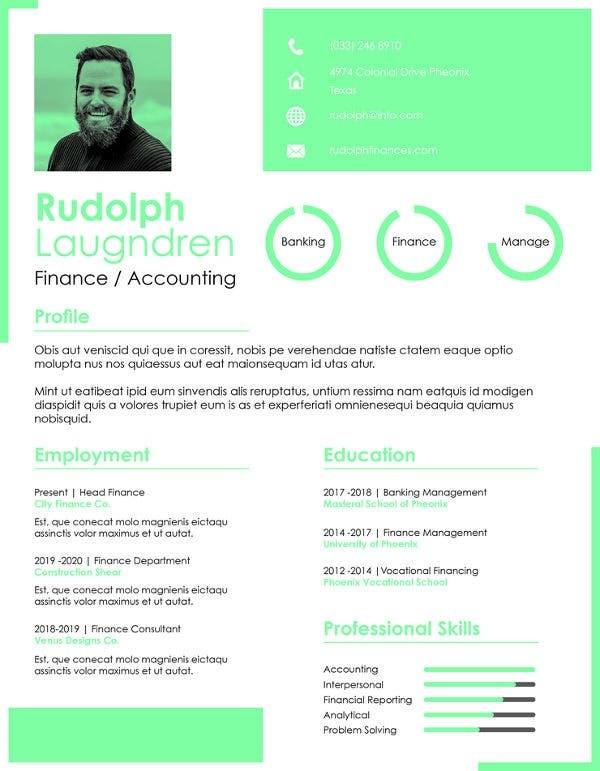 After knowing the elements and components of a finance resume, you can check out the list of steps that we’ve provided for you. 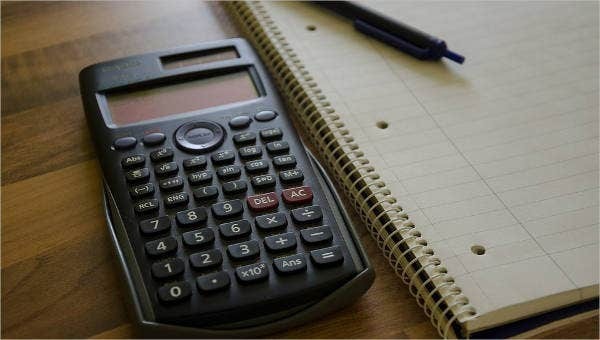 Like dealing with a finance curriculum vitae or finance cover letter, one should know the rationale and purpose why you’re making that document. 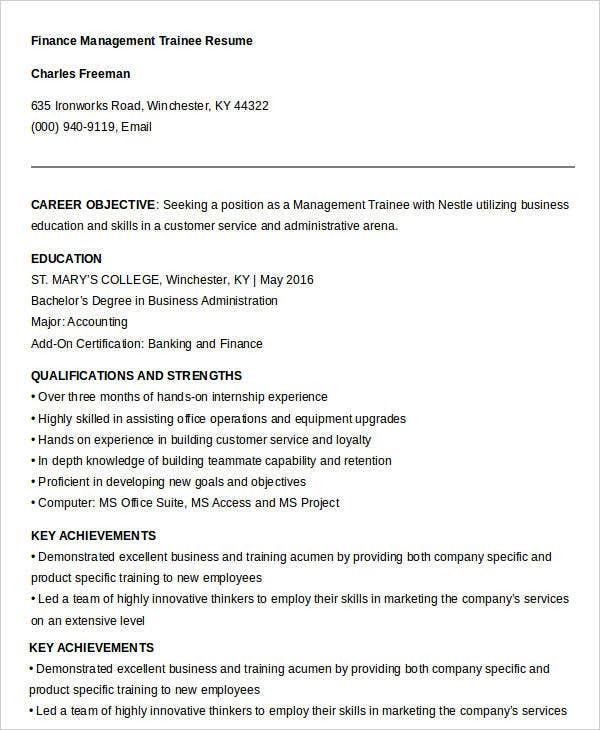 Never underestimate the power of a good resume. It can direct your career to more opportunities and areas for development. Your resume should describe who you are as a person and as an aspiring or experienced finance officer. Under your professional summary, make it easier for hiring managers to know where your career is heading which is definitely in line with your expertise. Use positive and formal language. 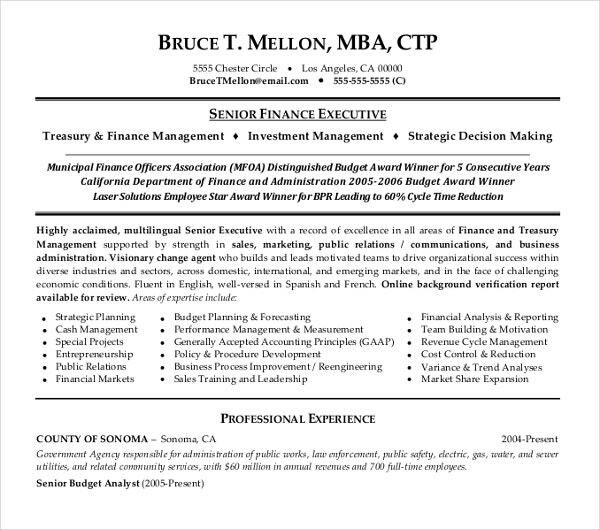 In dealing with a finance resume, the content, format, and language used must be formal. Do not incorporate jokes or any unnecessary words. Adopt a formal format. In here, you have to take into account the paper size, length, margins, line spacing, font style and size, section headers and many more. Ensure that you use a clean and high-quality paper. In terms of size, you can use the standard U.S. letter size of 8.5×11 unless the employer requires another size. The line spacing should be consistent. Use formal font styles such as Times New Roman. And lastly, don’t forget to emphasize your subheaders. Use bullets for easy skimming. Check the way you apply punctuation. Include relevant content. For your educational background, start listing the most recent one. Also, indicate the academic institution where you received the degree with the corresponding dates. For your work experiences, do not write them in a narrative or story-like format. Use strong and appropriate action words. Most especially, make use of keywords. You can indicate a short description of your work positions before emphasizing on the favorable results that you contributed. Do not include exaggerations or, worse, include false claims. 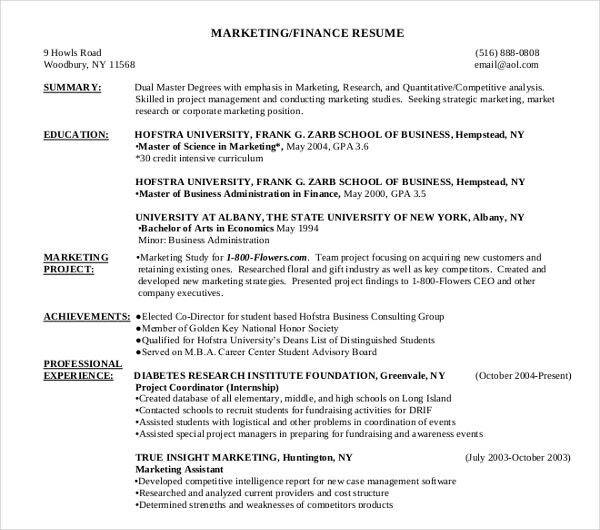 Make sure that what you include in your resume is true and can be supported by evidence. Promote your self. Promoting yourself does not only mean writing about your features an excellent academic background. You have to give the hiring managers reasons to hire you. Indeed, your best resume must give the hiring managers an impression that you can be a great asset to the company. So don’t waste your chance to show off your skills. Put your best foot forward and land that corner office you’ve always wanted.